Since I do sysadminy stuff all day, I don't really get a chance to do much coding (or not as much of a chance as I would like). 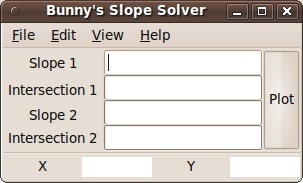 You can imagine my joy when my girlfriend expressed a problem she needed solved: "I'm going to need to solve 100s of slope equations, i.e. where two lines intersect. Can you write a program to do it?" Sure! I asked if she wanted to do a batch input or just a one-off type of deal, she decided on the latter. Although I've done a fair bit of PyGTK stuff, I had never actually needed to convert it to Windows. I debated using IronPython -- but needed to use a special library to help solve the equations (I'm lazy). So, where is the power in Python? After about 15-20m I had a console based app that could solve the slopes. I added the Linux GUI part in maybe 45m, and then the Windows part in, well, not 45m! Either way, screenshot is below. Thanks girlfriend, I had fun!